Harrisburg, PA – October 24, 2017 – This morning, elected officials stood with advocates to push for an expansion of Pennsylvania’s hate crime definition. As state law currently stands race, color, religion or national origin are protected classes under the hate crimes statute. Pending legislation in the Senate (SB 96) and House (HB 505) would reenact Act 143 of 2002 and again extend these protections to include ancestry, mental or physical disability, sexual orientation, gender, and gender identity. 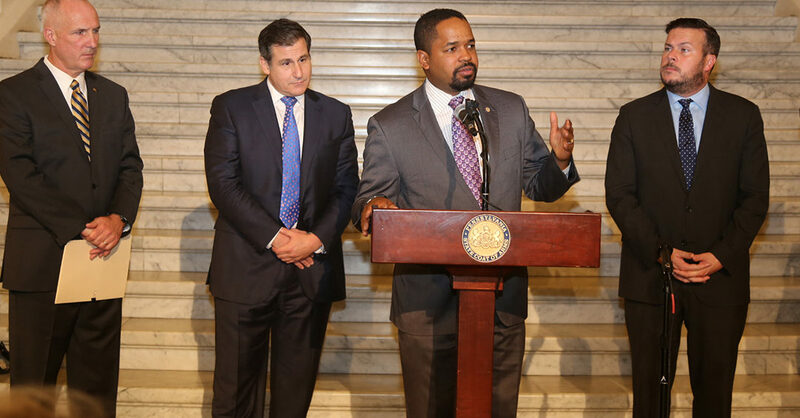 Republicans, Democrats, Representatives, Senators, activists, and the Lieutenant Governor all expressed their disappointment that this bill is not yet law – and urged the General Assembly to move quickly to protect more Pennsylvania citizens from hate crimes. “For those of us who revere the Constitution and appreciate the deep sense of liberty it enshrines, expanding hate crimes protections to include ancestry, disability, and gender identity is the right thing to do in Pennsylvania and around the country,” said Senator Anthony Williams (D-Philadelphia). “By expanding the groups covered by hate crime laws, we are telling everyone that their human and constitutional rights are sacrosanct, and those who attempt to cripple those rights will face the full force of the law,” Representative Thomas Murt (R-Montgomery) said. “The Philadelphia Bar Association supports and encourages enactment of an amendment to the Pennsylvania ethnic intimidation law to add protections for ancestry, mental or physical disability, sexual orientation, gender or gender identity,” said Philadelphia Bar Association Chancellor Deborah R. Gross.